Chester Bennington has a broad palm, a long low-set thumb, and a very highly developed Lower Mars and Jupiter mounts as well as bent fingers. His lines are not very deeply etched. The bent Saturn and Jupiter fingers are similar to that of Kurt Cobain (who also is believed to have committed suicide) although Cobain’s Saturn finger appears to be more severely bent. 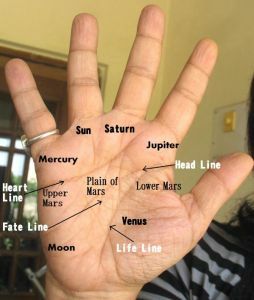 A significantly bent middle finger does point to a critical, negative attitude, and in Bennington’s hand is exacerbated by the longish third phalange of Saturn, and developed Moon mount, and poorly developed Upper Mars. These signs can indicate feelings of solitariness and moodiness and lead to feelings of discouragement. These characteristics do not necessarily point to a depressive personality, because finally, it depends on the mind. In Bennington’s case the Headline is not clearly visible in photographs on the internet but if one has to guess from one blurred photo, he could cope with reality. However, his lines are not deeply etched. This does point to someone who was delicate mentally, but there is nothing really which could have told us that he would kill himself. Was his suicide an impulsive act then? There are indications that the suicide was not planned. His hand shows impulsiveness. If one has to sum up one can say that Bennington’s hands show him to be a moody, lonely and talented person, and a very sensitive and compassionate one as well. However, his hands also show him to be aggressive, pushy, controlling and an ambitious go-getter. Almost like he was two different people. People kill themselves when they feel they have no hope, and my theory after studying his hand is that he killed himself because his temperament was at odds with itself, unable to handle the ups and downs that success brings with it in the modern world. And he wanted success like no other. You can also check out The hand analysis of music star Maddona or Michael Jackson's hands reveal his strengths and weaknesses or Can Lindsay Lohan's addictive behavior be seen on her hand? or that of Amy Winehouse who died of alcohol poisoning, or that of Kurt Cobain who is thought to have killed himself. "he wanted success like no other"
But he had greatest success, it's hard to imagine, what more could he gain in his career. We can only wonder, why it wasn't enough for him. One can never know what was going on in his mind.